I haven’t posted here in a little while, but I have managed to write a few posts elsewhere. On the Robbins Library blog, I wrote about four WWII books that I’ve read recently: The Guernsey Literary and Potato Peel Pie Society by Annie Barrows and Mary Ann Shaffer, Life After Life by Kate Atkinson (which I wrote about here previously), All the Light There Was by Nancy Kricorian (who is coming to the Robbins Library this fall! ), and Rose Under Fire by Elizabeth Wein, author of the fantastic Code Name Verity. Over on my personal blog (mostly recipes and dog photos), I wrote about which thirteen (13) books I brought with me on a recent one (1) week vacation, and then which of those I actually read. Also, if you’re interested in seeing what The Casual Vacancy or Mockingjay look like in Icelandic, or what The Fault in Our Stars looks like in French, I took photos of those book covers in the Reykjavik City Library and a bookstore in the 11th arrondissement of Paris, respectively. In other news, I found out I’ve been accepted to the New England Library Leadership Symposium (NELLS), along with my friend Anna, an awesome young adult librarian (read her blog! Unlike me, she actually sticks to a schedule). We’ll be there, along with 26 other participants, for a week later this summer, and I’m pretty excited to meet other librarians from around New England, exchange ideas, learn a lot…and maybe go canoeing. Ursula Todd is born during a snowstorm in England in February 1910. The doctor is unable to make it through the snow; the umbilical cord is wrapped around Ursula’s neck; she is born blue; she dies. Ursula Todd is born during a snowstorm in England in February 1910. The doctor arrives in time to save her from a dangerous birth, and she lives – for a while, before being smothered to death in her cradle by a cat. Ursula Todd is born during a snowstorm in England in February 1910. After the Armistice in 1918, the Todd family’s maid, Bridget, goes to a celebration in London, and returns with the Spanish flu, to which Ursula succumbs. Ursula Todd is born during a snowstorm in England in February 1910. She grows up, moves to London, and dies in a cellar during the Blitz. Ursula Todd is born during a snowstorm in England in February 1910. In school, she has an aptitude for languages; after school, she travels in Europe, eventually settles in Germany, and becomes friends with Eva Braun. These are only a few of the many lives Ursula leads. In each successive life, she is haunted by persistent deja vu. She sometimes senses when something bad is about to happen, and does what she can to avert it, but her actions are as likely to create worse consequences as they are to avert disaster. She never fully realizes or articulates to herself exactly what is happening, though she does grasp it in a vague way, and readers will pick up on the pattern (perhaps cycle is a better word) after a while. It is evidence of Atkinson’s skill that the reader is willing to invest and re-invest in Ursula’s character and the many different storylines. Some are easier than others to leave behind, and some linger in the mind. Each permutation also gives insight into the other characters, primarily Ursula’s family: her mother Sylvie, her father Hugh, Hugh’s sister Izzie, the Todds’ cook and maid and neighbors. The book business may be changing, but that doesn’t mean that many “traditional” elements aren’t crucial (see “In defense of editors,” October 2011). Books may have only one author, but many hands and minds go into their production, let alone their success. Note: The Sea of Tranquility was initially self-published. It was well-reviewed by book bloggers, and picked up by a mainstream publisher, the Atria imprint of S&S, which will issue a paperback edition in June 2013. The version I read was an advance copy of the Atria edition. The Sea of Tranquility is narrated in the first person, alternating between Josh Bennett and Nastya Kashnikov (not, as we learn eventually, her real name). Josh is seventeen; following the death of his mother and sister in a car accident when he was eight, and the subsequent death of his father and grandparents, he has been emancipated and lives alone. A former piano prodigy who has suffered a terrible trauma, Nastya has come to live with her aunt Margot and begins attending the same high school as Josh, where she does everything possible to alienate people. Most significantly, Nastya doesn’t talk; she hasn’t spoken out loud to anyone in over a year. Despite, or perhaps because of, Nastya’s silence, her handsome and charming classmate Drew becomes attached to her, and occasionally drags her out to parties. After she gets too drunk at one of them, he brings her to his friend Josh’s house for help; though they don’t hang out at school, Drew is Josh’s only close friend. It’s not rocket science to see where the book is headed; though both Josh and Nastya are closed off to others, afraid of being hurt again, they are attracted to each other. (This setup practically begs for a voiceover: Will they share their secrets and help each other heal from past hurts? Will they learn to love again?) Though there is little real suspense, I found the characters compelling, and the book strangely hard to put down; Josh and Nastya certainly do have chemistry, and Nastya’s backstory is eventually revealed through a coincidence that doesn’t feel too contrived. The author follows Rule #1 of YA novels (and fairy tales): get rid of the parents. Josh’s parents are dead, and Nastya lives with her aunt, but Margot is a nurse, and their schedules rarely have them home at the same time. Nastya has little contact with her parents and her brother, Asher, except for a couple visits and a few necessarily one-way phone calls. In terms of genre, I’d call it literary fiction/YA romance; it has some dark scenes and heavy themes, but the characters are 16-18 years old and much of the book takes place in or around the high school or the characters’ homes. The writing is good, and if it’s sometimes melodramatic, well, so are teenagers. 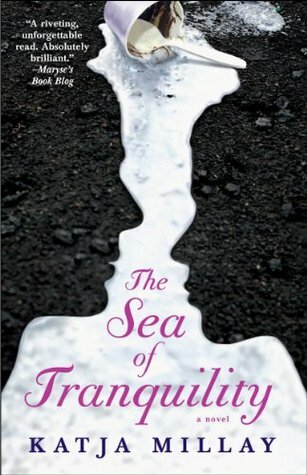 Though I was skeptical, I definitely enjoyed The Sea of Tranquility, and would read more from this author.